Stonewall Jackson song lyrics are pure classic country, if you love old style country music, you’ll love doing them. He recorded many songs during his long career that’s really fun to play and sing. Most of Stonewall’s songs are easy enough for us amateurs to do, remember, you don’t have be a good guitar player to enjoy your music. Stonewall Jackson was one of the most popular country stars of the early 1960’s having a string of top ten hits and becoming a fixture at the Grand Ole Opry. 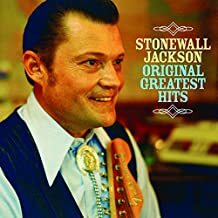 All through the 60’s Stonewall was a consistent hit maker with such great country songs as “That’s Why I’m Walkin”, “A Wound Time Can’t Erase”, “I Washed My Hands in Muddy Water” and B.J. The D.J. Whether you’re an expert guitarist or a beginner, you can have a blast doing these great old country songs. Take time to sing some everyday, it will make you feel better, music is a stress reliever. Get your family involved with playing a musical instrument and/or singing, it will form a tight bond with each other.